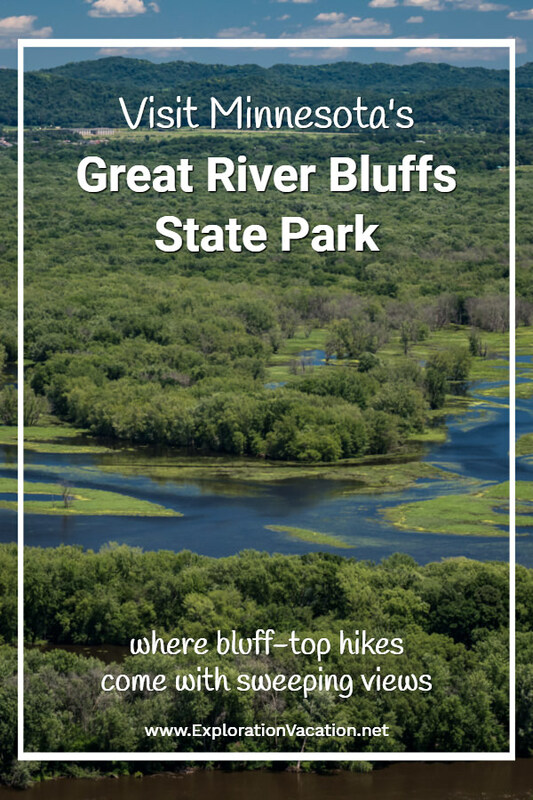 To visit Great River Bluffs State Park near Winona, Minnesota, is to enter a world where rugged bluffs are covered with a mix of woodlands and rare goat prairies and easy hiking trails lead to sweeping views of the Mississippi River far below. This post contains affiliate links. These links pay me a small commission if you use one to reserve a room or purchase certain goods or services. You don’t pay anything extra, but it helps keep this website running. To learn more, review this website’s policies and disclosures. Fall will soon bring brightly colored leaves to Great River Bluffs State Park, making it a great time to follow the Mississippi River to this park near Winona, Minnesota. But I visited during the summer, when the trees were green and so full of leaves they almost completely obscured views of the river far below. Still, summer was also a good time to visit Great River Bluffs, when shaded paths provided relief from the sun’s heat. Any time of year would be a good time to check out this small gem of a park perched high above the river valley. We only explored a small part of the park on our first visit here. But even a short visit was enough to guarantee we will return someday! For visitors with limited time, the North and South overlooks pack a lot of scenery into a quick and easy walk. Located just a short stroll from the picnic area and parking, two trails run along the top of the Mississippi River bluff to the scenic overlooks. We took the North Trail. It’s a mostly flat trail through a mixed hardwood forest. The mostly flat path is a tangle of roots from the trees overhead. Trees that assure the hiking trail will be cool and shady even on a hot summer day. But those leaves that provide protection from the sun also obscure views of the river below. Because I haven’t actually seen the river valley as we walked above it, it was a bit of a surprise to walk out onto one of the sturdy overlooks. Suddenly the Mississippi River and its backwaters and marshes were spread out below and across to the distant bluffs on the Wisconsin side almost as far as I could see. Great River Bluffs is a “natural” state park. As such, the emphasis here is on the protection, perpetuation, and restoration of natural resources. In keeping with this focus, the park includes protected Scientific and Natural Areas (SNAs) on both King’s and Queen’s Bluffs. Both areas are home to rare plants and unusual ecosystems. You’ll find scenery between here and St. Paul that can give the Hudson points. You’ll have the Queen’s Bluff–seven hundred feet high, and just as imposing a spectacle as you can find anywheres . . . . Drawing from Life on the Mississippi by Mark Twain (Samuel L. Clemens), published in 1883. Reproduced by the British Library and published on Flickr. While King and Queen’s bluffs have long attracted attention for their stature, they are also notable for the rare plants and unusual ecosystems they support. Great River Bluffs State Park is within Minnesota’s “driftless” area, a small part of the state left untouched by glaciers during the last ice age. This landscape provides a hint of what Minnesota looked like before the glaciers reshaped it. But the impact of the glaciers was felt beyond their physical reach. Here the most obvious sign of this indirect impact is the formation of the Mississippi River gorge, which was created as floodwater raced away from the melting glaciers. But there are other signs too. One of those is a living remnant of the glacial past still found in the rocky slopes of the park’s Mississippi River bluffs. Cedars first grew here during the cool, damp glacial period. But as the glaciers retreated, the climate changed. Over time, southeastern Minnesota became too warm and dry for cedars and they became a tree of the north. But there are still cedars here in the park, where small stands cling to sheltered rocky slopes. In these protected spaces, the cooler, wetter micro-climate allows them to continue growing where they have always been. A living remnant of the last ice age. While few visitors will be aware of the tenacious cedars, most will notice the unusual “goat prairies” found on the southern-facing slopes of both bluffs. These small prairies got their nickname because they were found thought to be too steep for any animal except a goat! But they aren’t unusual just because they are steep. With steep slopes that face south to southwest, these small patches of prairies (also called hill prairies, dry prairies, or bluff prairies) get as much sunlight as any solar panel. And all that sunlight makes these small prairies hot and dry. It also causes them to continually freeze and thaw, freeze and thaw throughout the winter. Those harsh growing conditions are compounded by thin soils that barely cover the bedrock below. Trees and other woody plants find it almost impossible to get a foothold here, which allows a wide variety of prairie plants to thrive. While not rare like the cedars or goat prairie, the mixed hardwood forests that cover protected slopes and the valleys are filled with wildflowers in spring. And, of course, the trees themselves burst into color each fall. As a park focused on conservation rather than recreation, Great River Bluffs has few developed facilities. However, a series of hiking trails allows visitors of all abilities to see many of the park’s features. The trail system is the main focus of activity within the state park and hiking is the main activity in the park for most of the year. The shortest and most accessible trails are those connecting the North and South scenic overlooks to the picnic area. A couple other, similar trails lead to other overlooks from the campground. For the most part, these trails are only for hikers. The King’s Bluff hiking trail is 1.25 miles long (2.5 miles round trip). Besides serving as a self-guided nature trail, it offers great views of the river valley and neighboring Queen’s Bluff. (It’s also the park’s Minnesota State Park Hiking Club Trail, for those of you collecting points.) It appears that this becomes a snowshoe trail in the winter, with only the first part open for skiing. A few other trails wander through the park. Some lead to additional overlooks, but many seem to simply meander through the forest. There are no trails on Queen’s Bluff, as it is entirely protected. A permit is required to access this part of the park. While it’s possible to hike in the park throughout most of the year, a few seasonal activities make the park particularly attractive at specific times. The park’s varied habitat makes it an excellent place to look for birds at any time of year. But the birdwatching is best during spring and fall when migrating birds travel through along the Mississippi flyway. More than 100 species can be found in the park over the course of a year. Raptors, including bald eagles, visit the park, as do a wide variety of – sometimes rare – song birds. Rare prairie plants and flowers are listed as a park highlight and other sites reference the park’s spring ephemerals. However, it’s hard to find much information on wildflowers in the park aside from the plant lists for the King’s and Queen’s Bluffs SNA. Even in summer there were a number of flowers in bloom but it looks like an excellent place to look for spring flowers. And, if you can’t find enough spring wildflowers, the park’s location along scenic Apple Blossom Drive should provide plenty of blossoms along the way. At Great River Bluffs fall color starts on the prairies when rusty gold grasses are punctuated with brilliant scarlet. Soon after the park’s maple-basswood and oak-hickory forests will become tapestries of red, green, and yellow that will be followed by rich golds and bronzes as winter approaches. Wherever you are in the park during the fall leaf season, you are likely to be surrounded by color. In this part of the state the best color likely to occur from late September to mid-October. But you can always check the year’s progress on the Minnesota Department of Natural Resources fall color website. Great River Bluffs State Park has about 9 miles of groomed cross-country ski trails, some of which are open to skate skiers and as well as traditional cross-country skiers. Most of the ski trails are marked as “easy” (after all, the park is largely on the mostly flat bluff top), but a few segments are more difficult. There is also a sliding hill once there is enough snow. For many, a few hours will be enough time for a visit to Great River Bluffs State Park. It’s a great road trip stop – especially in fall when the trees put on their colorful fall finery. That’s handy, because the Great River Bluffs is just one of a number of places to see along this section of the Great River Road as it follows the Mississippi River through southeastern Minnesota. For serious hikers looking to spend more time exploring the Mississippi River bluffs, this is one of a number of Minnesota and Wisconsin state parks in the area. There are plenty opportunities to explore both the river bluffs and the watery valley below. Are you a fan of Minnesota’s state parks, but Great River Bluffs doesn’t sound familiar? That’s because it used to be known as O L Kipp State Park. Kipp had a role in developing the state trunk highway system, but appears to have had nothing to do with this park and the name was changed a number of years ago to better reflect what the park is. Great River Bluffs State Park lies within the Richard J. Dorer Memorial Hardwood Forest in southeastern Minnesota. (The Dorer forest is also home to a number of popular water trails.) The segment with the state park is just off the highway connecting Winona, Minnesota, with La Crosse, Wisconsin. There is access to the park from the east/west via I-90 or from the north/south via US highway 14/61. The park entrance is off of I-90, but if you are patient and have a GPS you can also wind your way back to the park from Highway 61. If you are coming from Wisconsin, be aware that there are a limited number of bridges across the Mississippi in this area. Coming from Wisconsin, the I-90 bridge crosses the Mississippi to the south of Great River Bluffs at La Crosse. The US highway 14 bridge is also an option, as it crosses the river just south of I-90. To the north, the closest bridge is highway 54 in Winona. The next bridge is highway 25 up in Wabasha. Both US highway 14/61 along the Minnesota side of the Mississippi River and state highway 35 on the Wisconsin side are part of the national Great River Road scenic byway. Both routes provide an eye pleasing mix of bluffs, wetlands, and river views. A variety of mostly-charming small towns along the way offer additional opportunities to stop and get to know the area. You can visit Great River Bluffs State Park throughout the year. The park office is located about a mile into the park. It has is a small gift shop and park information. A map is also available outside when the office is closed. The map on the Great Bluffs website is a little less detailed than the one we picked up at the park. Unfortunately, the less useful online map seems to be the most current version. All motorized vehicles are required to stay on designated trails. Mountain biking, horseback riding, and snowmobiling are prohibited in the park. Like most Minnesota state parks, there is an entrance fee. All vehicles must display a Minnesota park permit in the front window. Visitors without a permit can pay the daily fee or purchase an annual permit at the park. There is a self-serve station available if the park office is closed. Great River Bluffs park is on top of a bluff, so many trails have at least a few steep slopes and drop-offs along or just off the path. Stay on the trail and watch your footing and you’ll be fine. Southeastern Minnesota is home to timber rattlesnakes. While you are unlikely to see one, if you do, just leave it alone and go around. It won’t hurt you if you don’t bother it. And snakes, like all wildlife, are protected in the park, so don’t try to catch or kill it. Great River Bluffs State Park lodging options are pretty limited. Further afield, a good variety of lodging options are available in Winona and La Crosse. A few camping, resort, and Airbnb options are also available in rural areas between the two cities. Camping is available within the park, but given the park’s focus on resource conservation, facilities are more limited than in many state parks. The main campground has just over 30 wooded back-in campsites with picnic tables and fire rings, but no electricity. All have access to drinking water, showers, and flush toilets. Two sites are designated as wheelchair accessible. Most of the sites don’t look very big and there is a size limit for RVs in the campground. There are no facilities for RVs either. A bicycle campground with 5 campsites is located off south-bound US Highway 61/14 for riders traveling the Great River Road bicycle route. There are NO camper cabins at this park. Individual campsites can be reserved at the last minute by contacting the park directly. Of course, sites can also be reserved through the Minnesota state park campsite reservation system. An advanced registration is always a good idea during peak periods because Minnesota state parks often have fully booked campgrounds. Camping is available from spring through fall. I haven’t camped here (and I’m not much of a camper), but we drove through the campground to check it out. Most campsites offered at least some shade and many looked pretty well screened from neighboring sites and the park road. (You can see pictures of them at the Campsites Report website.) On the other hand, they also looked a little small and rather close together. Still, it would be a beautiful place to camp – especially in the fall when the leaves are turning! Despite what you may see online, do NOT bring firewood into the park. Carrying firewood into the park can spread pests that damage or even kill our forests. For that reason, bringing firewood into any state park is usually forbidden. And you don’t need it, because firewood can be purchased right in the park. Both the Winona and La Crosse visitor websites also list local lodging options – including B&B’s and camping – and can provide a good idea of what the options are. The Great River Road national scenic byway runs through this area on both the Minnesota and Wisconsin sides of the Mississippi River. Along this portion of the route you’ll find spectacular scenery and quaint small towns. The two largest towns in the area are Winona, Minnesota, and La Crosse, Wisconsin. Both are old river towns with historic buildings in the old downtown. The city of Winona is an island in the Mississippi, with the river on one side and a lake on the other. An old steamboat landing, the town’s wealth grew as goods moved up and down the river. Today Winona is best known for its university, summer festivals, arts, and beautiful surroundings. That means there is plenty to see and do right in and around town. Further south, La Crosse has a similar history, but is a larger, more sprawling place today. Still, the historic heart of the city is a charming, walkable spot to spend some time. There are also plenty of good spots to eat and drink. And, for those who want to get out and explore, there are lots of outdoor options, including bike and canoe trails. Little John A Latsch State Park is basically a scenic overlook high above the Mississippi River. It’s a half-mile hike up stairs to get there. Moving away from the river, Whitewater State Park offers a bit of everything, with bluffs, ravines, prairie, oak savanna, trout streams, and a sandy swimming beach. Perrot State Park offers scenic hiking on the bluffs and in the river valley below. Trempealeau National Wildlife Refuge offers short walking trails, excellent bird watching, and an interesting walking/biking/driving loop that takes visitors through a variety of ecosystems in the refuge. Merrick State Park is the place to go to get out on the water and explore the marshy backwaters.